ICMSF Annual Meetings – ICMSF Annual Meetings are frequently held in conjunction with workshops and conferences. See Support for a listing of the location of ICMSF annual meetings since the Commission’s first meeting in 1962. ICMSF-Associated Conferences – The Commission contributed to the organization or presentations at the following meetings, workshops and congresses. ICMSF organized a session entitled Importance of Microbiological Criteria and Statistical Underpinning of Sampling and Testing for Food Safety Assurance for IAFP’s 2018 European Symposium. Leon Gorris started by describing the setting of international fppd safety management and microbiological criteria in Codex. This was followed by Marcel Zwietering who explained the detailed statistical specificities of sampling for various situations. Wayne Anderson then gave the ICMSF perspective on sampling and provided examples from ICMSF’s Book 8. The session was well attended by about 80 people and there was a lively discussion. 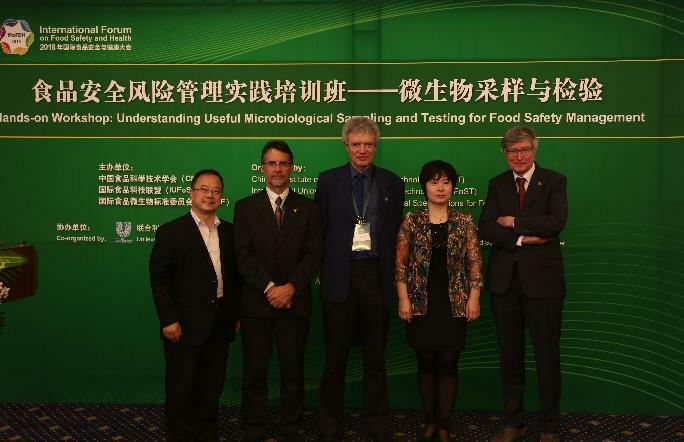 ICMSF experts Leon Gorris, Tom Ross and Marcel Zwietering ran a hands-on Workshop in Beijing, China on useful Microbiological Sampling and Testing for Food Safety Management. Seventy Chinese food safety professionals from government, industry and academia attended the workshop. The session was designed to give participants a deep and hand-on understanding of useful microbiological sampling and testing, with specific attention to the underlying statistics, sampling plan performance and development and interpretation of microbiological criteria. As part of their training resources, all participants received a signed copy of ICMSF’s Microorganisms in Foods 8: Use of Data for Assessing Process Control and Product Acceptance translated into Chinese through the effort of a team led by former ICMSF member Xiumei Liu. According to Dr. Wang Jun (Director of Division 2 of Food Safety Standards, China National Center for Food Safety Risk Assessment) the workshop was an important contribution to the further strengthening of the professional quality of China’s food safety work by giving the Chinese professionals a solid understanding of the utility of microbiological food safety testing. The workshop was a joint effort of several organizations that strive to advance food capability building in China and around the globe. It was organized by ICMSF in conjunction with the Chinese Institute of Food Science and Technology and the International Union for Food Science and Technology, co-organized by the Unilever China Consumer Products Safety Collaboration Center in Shanghai and sponsored by the Walmart Food Safety Collaboration Center in Beijing. At the occasion on the 47th session of the Codex Committee for Food Hygiene (CCFH), ICMSF organized a side-event on the topic of Whole Genome Sequencing (WGS) on 12 November 2015. The meeting was chaired by Leon Gorris (Unilever, The Netherlands), representing ICMSF, and attended by well over 100 delegates coming from 56 countries. The Commission participated in the recent Congress of the International Union for Food Science and Technology (IUFoST) held in Montreal on 17-21 August 2014, with a session on Food Safety – Role of Microbial Testing in the Context of Risk Management Based on Book 8 (ICMSF) held on 18 August 2014. This was the first time that the ICMSF has participated in an IUFoST Congress. A talk on Interplay between Risk Assessment and Risk Management and The Emergence of New Food Safety Metrics was given by Jeff Farber, Director, Bureau of Microbial Hazards, Health Canada, Food Directorate, Ottawa, ON, Canada, whilst a talk on Risk management metrics and their relationship to microbiological criteria and testing was given by Martin Cole, Director Food and Nutrition Flagship, CSIRO, Australia. The rest of the session was dedicated to a panel discussion on the important and very relevant topic of Future needs for HACCP and Risk Management in Controlling Microbiological Hazards in the Global Food Supply. The aim of the panel discussion was to discuss the role of HACCP in light of advances in risk management and increasing importance of pre-requisite controls in ensuring the safety of food and the increasing need for through chain control measures. What are the current issues and experiences with the application of HACCP in the emerging food safety issues? How are HACCP principles evolving to cope with complex through chain issues? How can we make the stringency of HACCP plans more quantitative and risk based? MICROAL 2014 was the result of the joint effort of several groups from Latin America involved with food safety. This congress was one of the most important international food safety events to be held in Latin America, with sessions on hot topics in food microbiology and food safety. It was a unique opportunity for networking and exchanging information with professionals from academia, government and the food industry. Jointly organized by the International Commission on Microbiological Specifications for Foods (ICMSF) and the International Life Sciences Institute-India (ILSI-India). Cosponsored by the India Ministry of Food Processing Industries, GOI Agriculture and Processed Food Products Export Development Authority (APEDA) and the Indian Council of Medical Research, GOI. 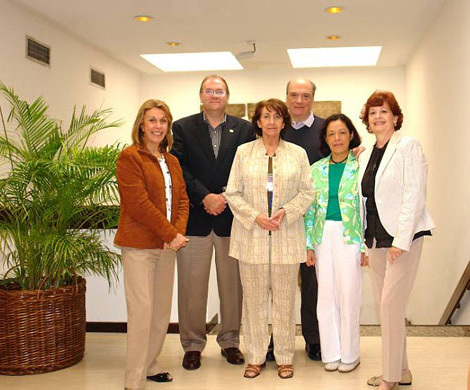 In May 2007, 817 attendees from 20 countries converged in Margarita Island to hear 34 international and 33 national guest speakers present recent developments in food safety and quality, food science and technology, consumer trends and regulatory issues from a multidisciplinary perspective. More than 300 scientific abstracts were presented, and delegates also attended several pre-meeting short courses on topics ranging from rapid methods for microorganism detection in foods, methods validation, and methods to establish food shelf-life. International Commission on Microbiological Specifications for Foods (ICMSF), Award: “Listeria monocyotogenes molecular typing using RAPD and sequence of actA and hly genes.” Authors: Vanegas López, Maria Consuelo; Medrano Medina, Mayra Viviana; and Marino Ramirez, Leonardo. Universidad de Los Andes, Colombia. Publitec Award: “Use of reverse transcription-PCR for transgen detection. Model: Coffee transformed using the B. thuringiensis cry1ac gen.” Authors: Soraya de Guglielmo C.; Rosanna Valerio; and Andrea Menéndez. Laboratorio de Clonación y Genética Vegetal, Instituto de Biología Experimental de la Universidad Central de Venezuela y Departamento de Biología de la Universidad de Oriente, Venezuela. Dr. Josefina Gómez Ruiz Award: “Magnetic inmunoseparation as an alternative rapid method for Salmonella detection in foods”. Authors: Diana Rosentul and Patrica Blasco. Gerencia de Soporte Científico, Empresas Polar, Venezuela. Instituto de Ciencia y Tecnología de Alimentos, Universidad Central de Venezuela Award:“Use of alginate and gelan as probiotic edible coatings in fresh-cut fruits.” Authors: Rodriguez, Francisco J.; Tapia, Maria Soledad; Rojas-Graü, Maria Alejandra; Ramírez, Jorge; Carmona, Andrés; and Martin-Belloso, Olga. Facultad de Ciencias, Universidad Central de Venezuela. Organizing Institutions: ICMSF; Chinese Institute of Food Science and Technology (CIFST); National Institute of Nutrition and Food Safety, China CDC Committee on Microbial Toxins, Chinese Association of Microbiology; Association of Analytical Chemists (AOAC), China Section; International Life Science Institute (ILSI) China Focal Point; International Union of Food Science and Technology (IUFoST); Food Science Australia. Undertaken by: Chinese Institute of Food Science and Technology (CIFST), National Institute of Nutrition and Food Safety, China CDC. Sponsored by: Silliker Group Corporation, USA; bioMérieux China Limited; 3M; Unilever; DuPont QUAL ICON; Beijing Sanyuan Foods Co., LTD.
Conference presentations are available from the website of the Chinese Institute of Food Science and Technology.